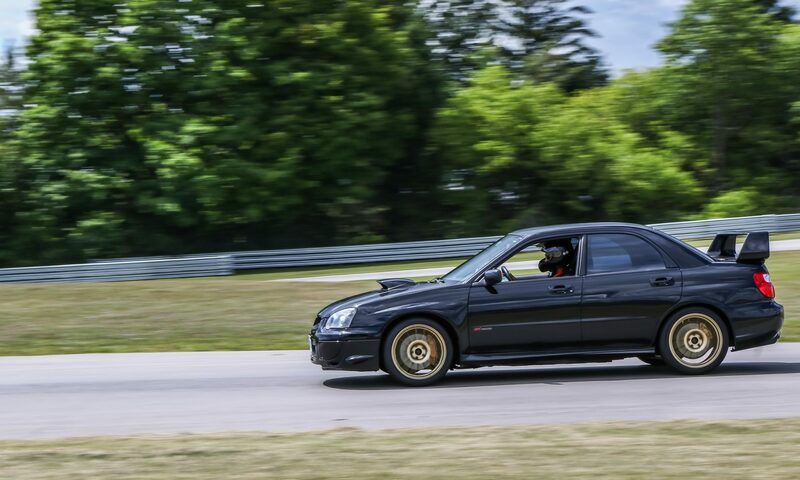 After a long winter I was itching to get back to the track as soon as possible. 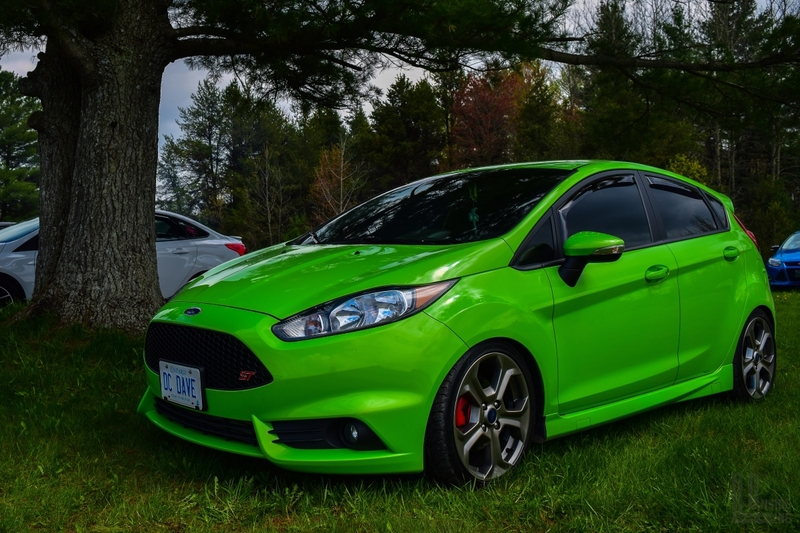 It turned out Focus Ontario was hosting a season opener meet at Canadian Tire Motorsports Park on the same weekend as the first CASC club race. 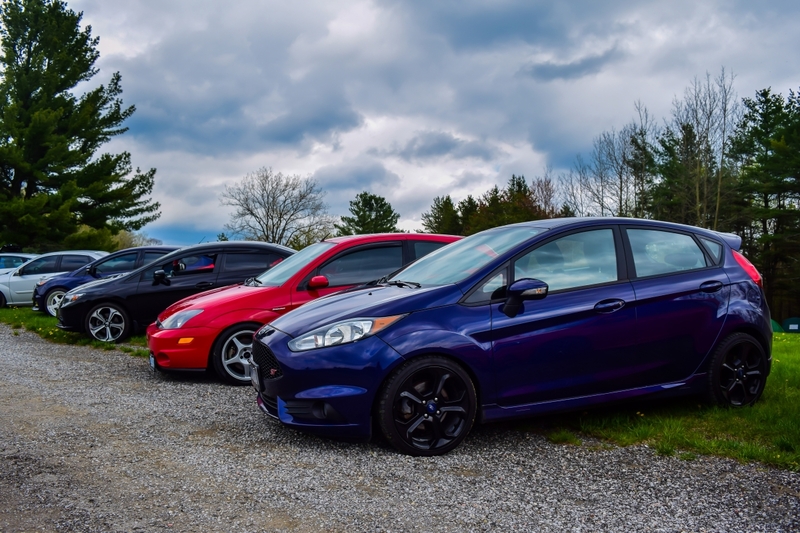 I decided to drop by and crash the party with my Fiesta! As soon as I pulled up to the meet I saw this super clean ZX3 Focus. I’ve always wanted to park next to one and compare it to the size of the Fiesta ST. The two cars are indeed eerily similar in size, but the Fiesta looks awkwardly tall compared to the aggressive squat of the Focus. Keep in mind the ZX3 had lowered suspension. It’s also packing a Procharger under the hood making about 286 hp at the wheels! 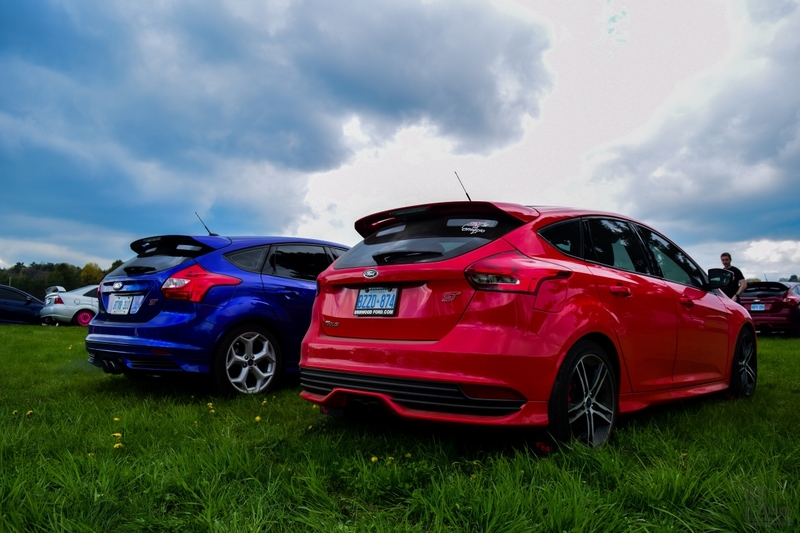 Parked on my other side was a post-facelift Race Red Focus ST. It’s no surprise that a lot of Mk1 Focus SVT owners consider the Fiesta ST to be the spiritual successor to their cars. 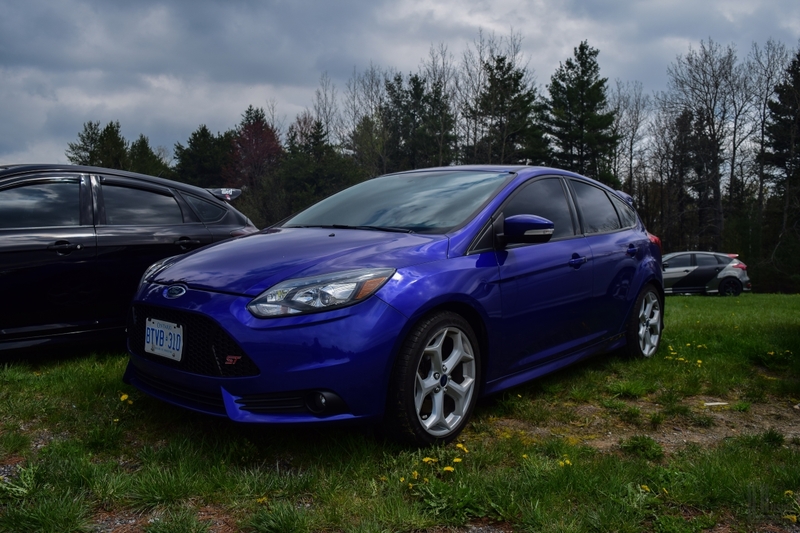 The Mk3 Focus has become a much larger car than the first generation cars. Granted, it has also moved upmarket since then. Other than being the only other FiST other than myself at the meet, this car immediately caught my attention as I pulled in. The eye-catching Green Envy paintjob looks awesome in person. No matter how hard I tried, I could not capture how awesome it looked in person! Even though the event ran from May 13-14th, it felt like we went through 3 seasons worth of weather in one afternoon. We went from cold, cloudy, windy, sunny and warm, then rain within the span of a few hours. 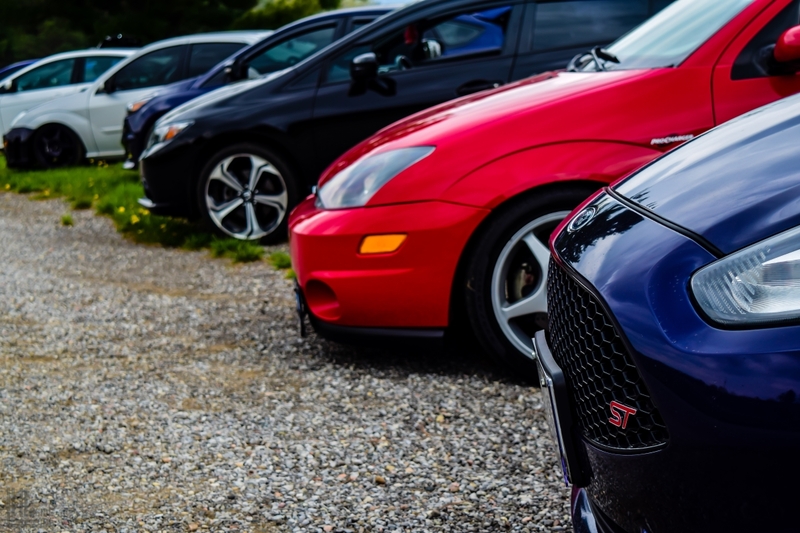 Initially I felt a bit out of place at a Focus meet, but I was no longer the outlier after a Chevrolet Cobalt SS and Nissan Sentra SE-R pulled up. Carbon fiber wrap being applied at the meet, because why not! The exterior was wrapped in a reflective silver which contrasts nicely with the matte carbon fiber. 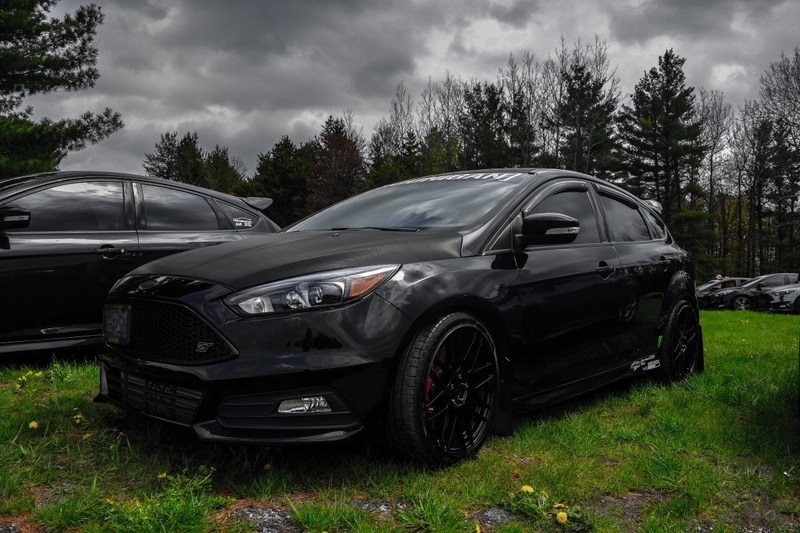 If Darth Vader commutes to the Death Star in a Focus ST, this would definitely be it. I’d say this was the cleanest car at the meet which is no easy feat for a black car! Even though my Kona Blue has grown on me I still really like the lighter Performance Blue. 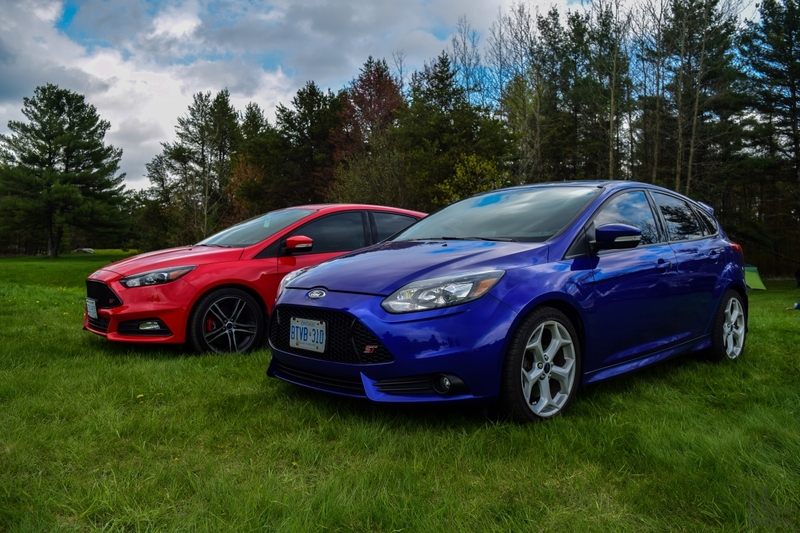 Side by side comparison of a 2016 Racing Red and 2014 Performance Blue Focus ST. Ford gave the FoST a facelift in 2015 so this was a good opportunity to see the two lined up beside each other. Although I’ve always liked the pre-facelift Focus ST from 2012-2014, I think the new cars are a big improvement. The front end is more aggressive and the rectangular fog lights and revised headlights look much sharper. Subtle changes in the rear end. I actually prefer the previous rear bumper but the new tinted taillights look much better. I didn’t get any comparison shots, but the interior of the post-facelift Focus ST is also an area of improvement. The new interior actually looks a lot like the more expensive RS. I love the updated D-shaped steering wheel too which I really wish was on the FiST too. There was also some car racing on the track all day. Club level motorsport events do not have the budget of big series like IMSA but it’s always a treat to see people racing their pride and joy on track. I always enjoy watching GT racing and vintage cars go wheel to wheel against each other. 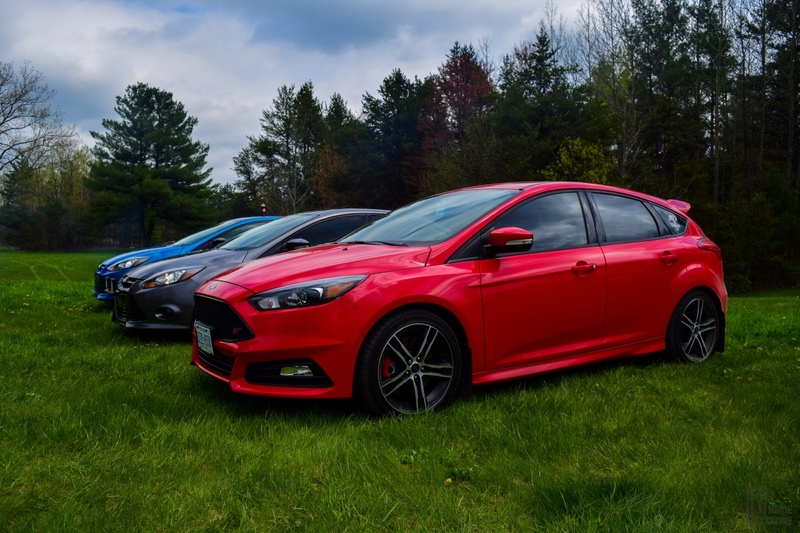 If you’re a Ford Focus owner, make sure to check out the Focus Ontario Facebook Group for upcoming events. It doesn’t matter if you have a Mk1, Titanium, ST, RS or whatever other trim level, all are welcome. The club was also proud to announce that it raised $350 over the weekend for the Candlelighters of Ottawa Charity, great job team!